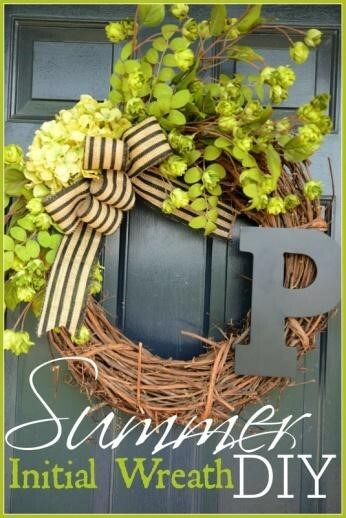 If you love to decorate your home with cute little projects that are fitting for the holiday or the current season, you are going to love these summer door decorations. Each can be made with just a few materials so they are inexpensive, yet they add that extra bit of flare you are looking for. Liven up your entryway by displaying one or more of these crafts throughout the summer months. Bring the beach home with you with a wood cut out flip flop. This decoration is simple to make and you can create it in a way that is unique to your own personal style. All that you need is a jigsaw, some paint, a piece of hardboard, and a flip flop pattern. You can tie some rope on the top to complete the look before attaching it to your front door. Nothing yells summer time quite like a juicy watermelon. This snack brings up memories of splashing in the pool and heading to the beach. 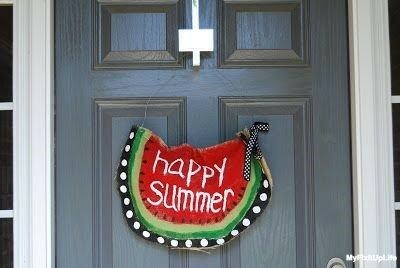 Welcome guests with this cute, fun, and fairly inexpensive burlap watermelon door decoration. All you need is some fabric that can withstand the outdoor environment, yarn, and ribbon. This project is so simple even a kid could do it! Show off your patriotic side with a simple yet beautiful craft that can be done with just a few materials. 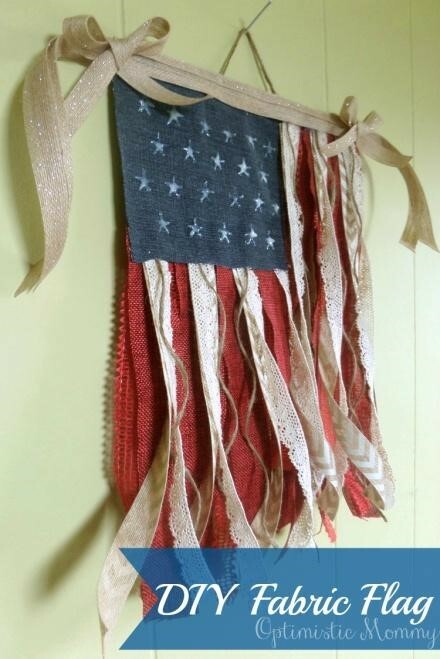 You can use an old piece of denim, some ribbon in red, white, and blue, a little twine, fabric paint, scissors, and hot glue to whip this USA flag together quickly before the holiday. Now that school is out and the kids are home, the ringing of the doorbell can be never-ending. One cute and simple way to let all the neighborhood children know if your kids are available for some outdoor play is a fun chalkboard. 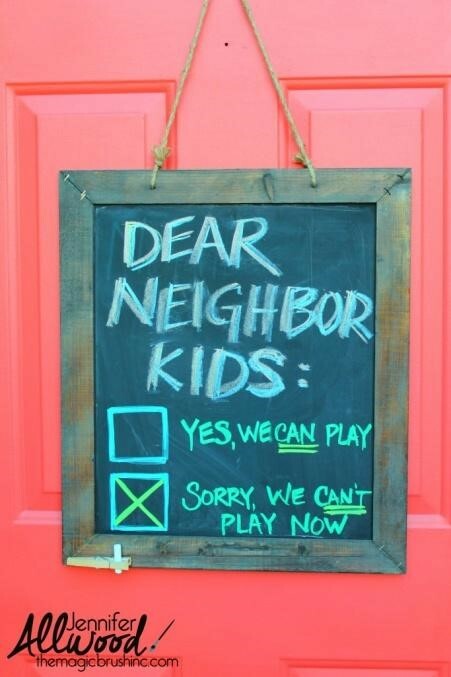 It looks cute hanging on the door and it will let your kid’s friends know if it is okay for them to come outside. This way you do not get disturbed if you have something going on. 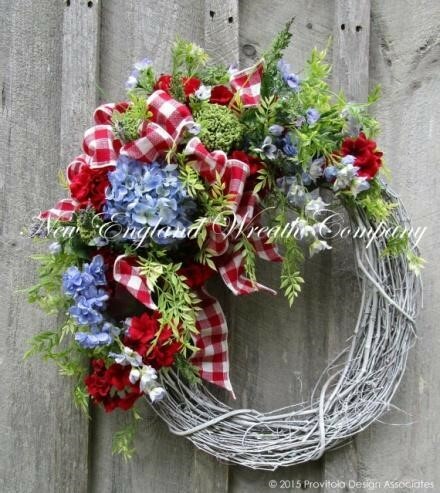 Another way to show your love for the country is with a 4th of July wreath. Gather up some ribbon, a few flowers in red, white, and blue, and a wreath that suits the size you are looking for. This is cute enough to hang all season long. 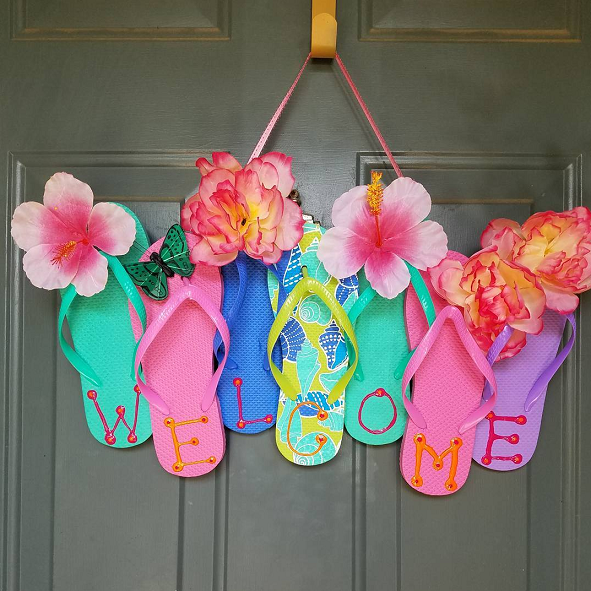 The flip flop wreath is one of the newest trends among DIY individuals and crafters. These can be made to suit any décor or personal preference and the materials are easy to find and cheap to purchase. 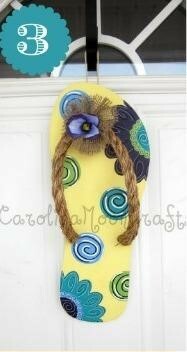 Get a few pairs of flip flops in various colors, some strong glue, and a few flowers or other add-ons. There are many ways you can configure them to from this line of flip flops, to a circular wreath. 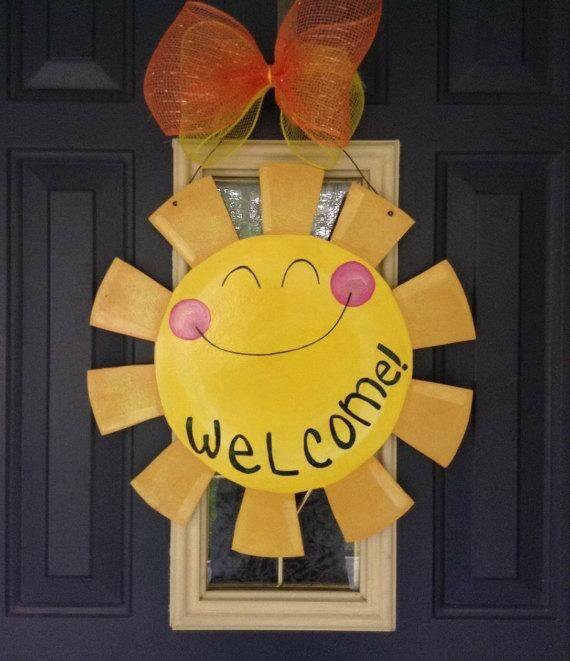 A sun door hanger is simple yet effective and welcomes all your friends and neighbors will a smiling face. It can be plainly put together and hangs easily on any front door. 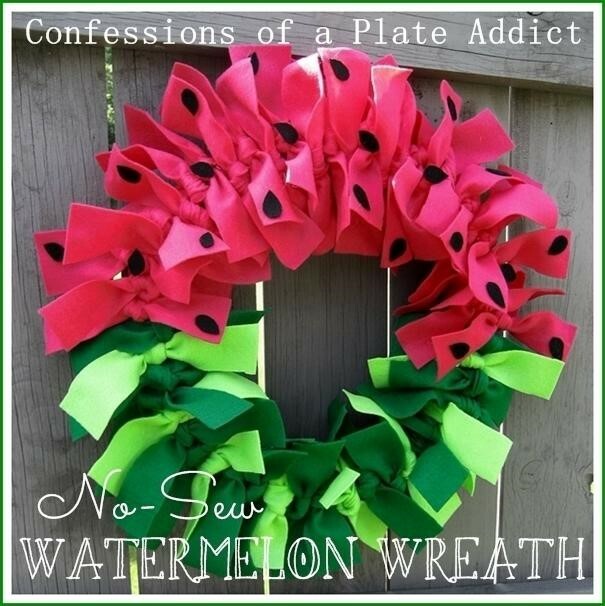 With a foam wreath and a few strips of fabric this watermelon wreath can be created with no sewing at all. Cut and tie the material to fit the look of the summer fruit and you can have this decoration up in no time. A patriotic 4th of July grapevine wreath looks so good people will think that it was made by a professional. 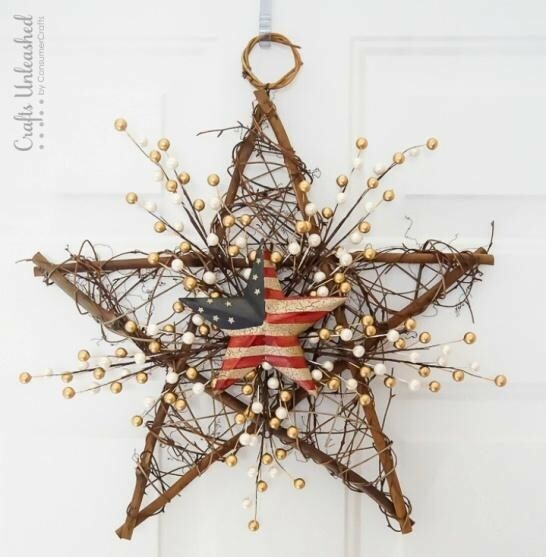 It shows off support for America while matching perfectly with a rustic or country décor. For a wreath that gives a personal and unique touch with just a little bit of a wow factor for summer, check out this grape wreath. You can add your own favorite bow and your initial to make it represent you and your family. Need a new door to showcase all of your cute decorations? Get in touch with the creative professionals from Doors of Elegance to find your perfect door to decorate for this summer. Our highly-trained team has the knowledge and experience you are looking for when it comes to making sure your door is exactly what you want! Contact us today.